Okay, everyone! Here is Part 2 of my 40th Birthday Bash Giveaway! 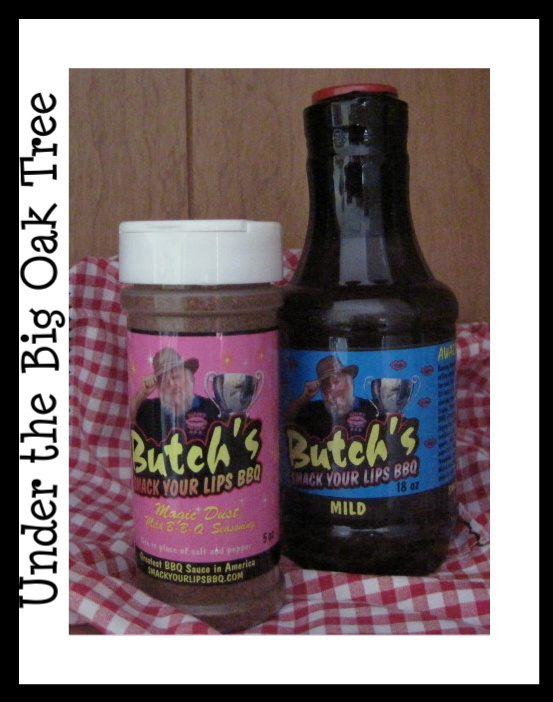 Butch's Smack Your Lips BBQ has agreed to send THREE Under the Big Oak Tree readers some products! and a jar of Magic Dust Dry Rub! serve no swine before it's time!" So, to enter to win, please complete the tasks below and leave a comment here on this post for each completed item. Comments for tasks are your entries. Don't forget to provide your email address so I can contact you if you win! Check out the Butch's Smack Your Lips BBQ website and come back to this post and leave a comment telling me something you've learned from the site. 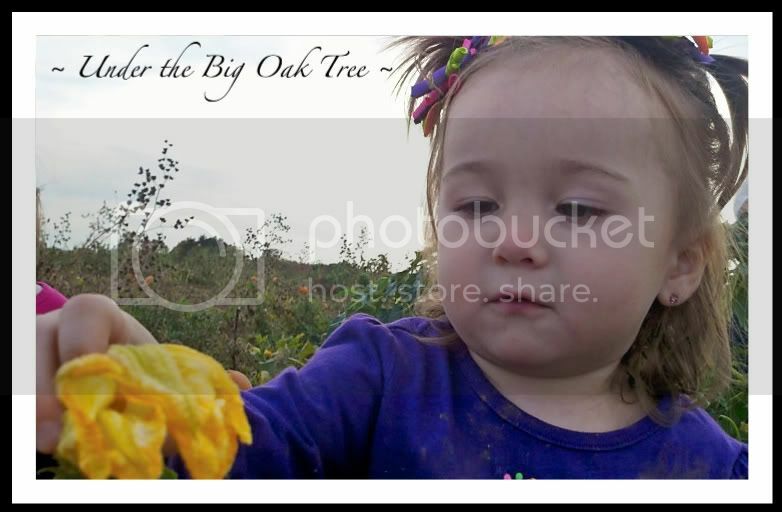 Like Butch's Smack Your Lips BBQ on Facebook and tell them that Under the Big Oak Tree sent you. Tweet this Giveaway and provide the link in your comment here. Blog about this Giveaway and provide the link in your comment. This giveaway is part of my 40th Birthday Bash Giveaway! Other giveaways will be announced in the next couple of days. If you enter any of my other Birthday Bash Giveaways, you can earn an additional entry for each one. Just come back here after entering the other giveaway/s and let me know which ones you've entered. Leave a seperate comment for each one. Please provide your email address with your comments. I need to contact you in order to let you know that you've won. To avoid spam, you can enter your email address like this: UnderTheBigOakTree at gmail dot com. Remember, comments are counted as entries. So to earn entries (mandatory or additional) you must leave a comment for each task (after task is complete) for it to be counted. Additional entries or bonus entries will only be valid IF the mandatory entry is complete. Giveaway will close on November 15th at 10:00 pm, EST. Winners will be chosen by random.org and contacted by email. Winners will also be announced in a new blog post and will have 48 hours to claim their prize. This giveaway (Butch's BBQ) is for residents of the US or Canada only. I was not compensated in any way to do this review. Butch's Smack Your Lips BBQ provided me with 2 non-returnable products for my family to sample and review as well as the products provided for this giveaway. The opinions stated in this review are honest and my own. I just can't believe it! 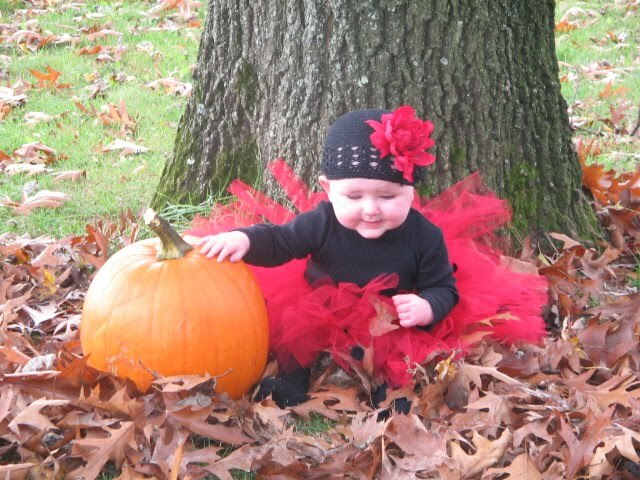 Halloween is almost here...and soon after, Grace will be turning 18 months old. My baby is turning into a little girl and it's breaking my heart! Don't get me wrong, I'm a proud momma. I love each and every one of her accomplishments...I just wish the baby phase lasted just a bit longer! 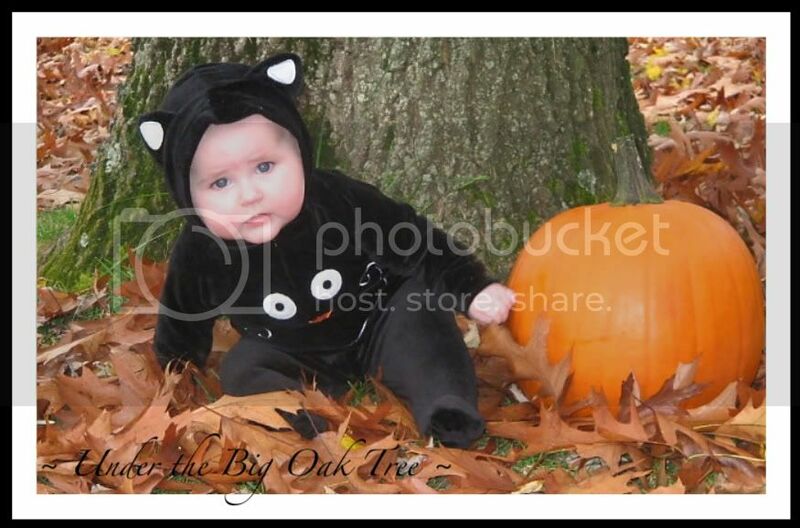 This past week, I've been going through some pictures that are on the old computer and came across some of the pictures of Grace from Halloween last year. Wow! What a difference a year makes! 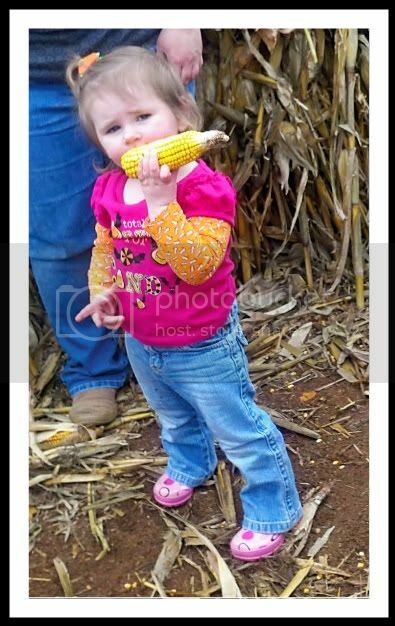 I can't wait to see her dressed up in her costume this year! She's going to look so sweet dressed up as a bumble bee! I'll be sure to post some pictures of her next week! 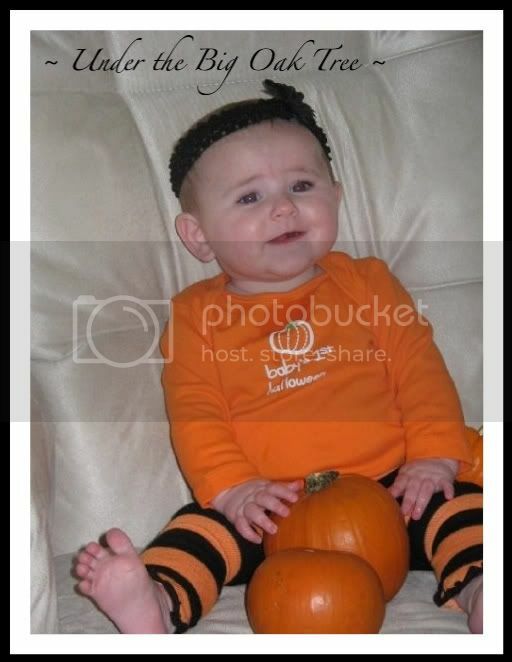 In the meantime, I'll share a few pictures of Remmy on her first Halloween! 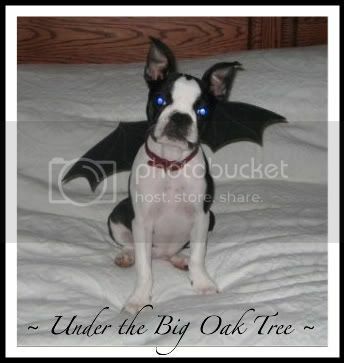 My nieces said she looked like a bat because of her big ears. 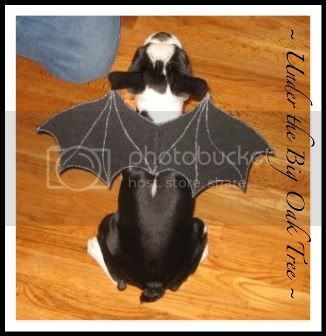 So, I made her some bat wings out of felt and attached to a clothes pin that could be hooked to her collar or harness! 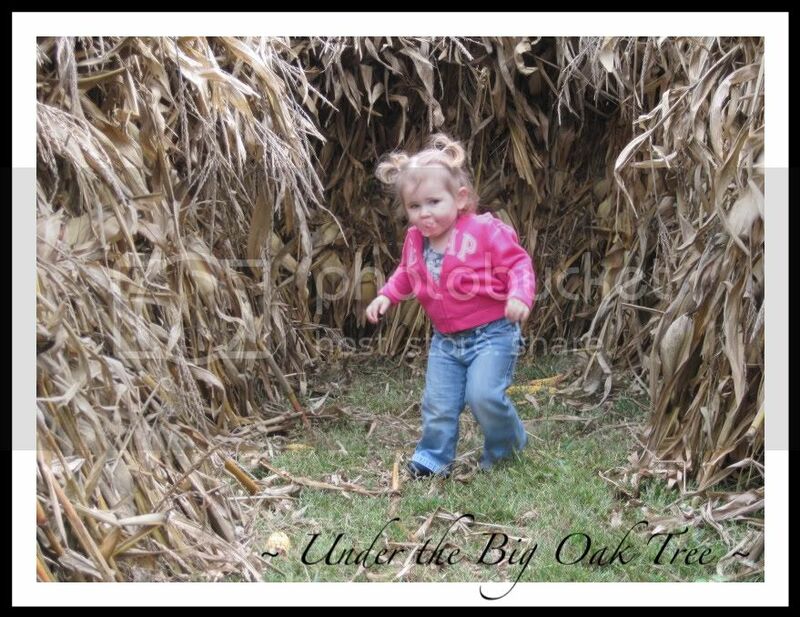 I'll be linking this post to the 2nd Annual Happily (un)Haunted Halloween Photo Contest hosted by Parenting By Dummies. Have you ever heard of VitaTops? 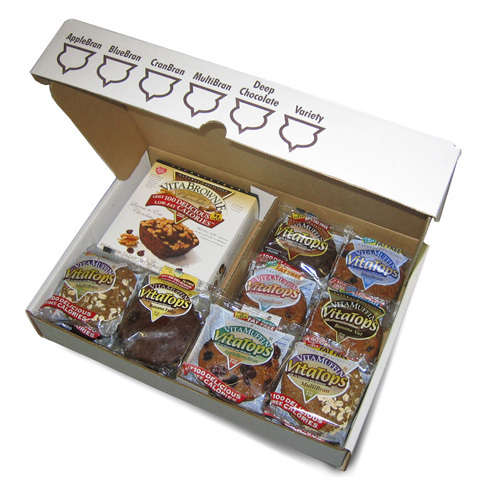 They are wonderfully, all-natural, 100 calorie snacks from Vitalicious.com that are filled with fiber and nutrients, yet low in fat. I first heard about them from reading my daily emails from the Hungry Girl but I never got around to ordering them. When Debbi from Debbi Does Dinner Healthy & Low Calorie hosted a VitaTops giveaway a couple of months ago, I just knew I had to enter! I couldn't believe it when she contacted me to let me know that I was the winner! It was perfect timing too, since I just recently started dieting! I was so excited and anxiously awaited my package from Vitalicious. When it arrived, I couldn't wait to rip open that box so I could try one! On one hand, I was skeptical. Most 100 calorie snacks, while very tasty they are also very tiny. So, looking at this very normal-sized snack, claiming to be just 100 calories, had me wondering what sort of tasteless fillers were added to make it a normal size. Also, being the junk food junkie that I am, I wasn't sure about the all-natural /no preservatives part. Sure, I do like some healthy stuff, but old habits sure are tough to break! On the other hand, I've never been disappointed in anything suggested by Hungry Girl. I trust her judgement! The first Vitatops I tried was Deep Chocolate. Mmmmm! I couldn't believe it! My dieting prayers were answered! Seriously! Not only was it tasty and filling, it also satisfied my sweet tooth! The Deep Chocolate is definitely one of my favorites...only to be topped by the Triple Chocolate Chunk. TRIPLE CHOCOLATE, people! Need I say more? Vitatops are perfect for dessert or an on-the-go snack, perfect for breakfast or added to the kids' lunch boxes. If chocolately muffins aren't your "thing" for breakfast, Vitalicious also offers other flavors such as: Raisin Bran, Banana Nut, Apple Crumb, or Blue Bran (another favorite). The Super Sampler Pack arrived a couple of days before my nieces were here for a visit. Their ages range from 10 through 16. The 10 year old being the picky one. I served the Vitatops as dessert after lunch, allowing the girls to choose whatever flavor they wanted. They all chose one of the chocolate varieties and all really enjoyed them...even the picky one! Shortly after receiving my prize package of VitaTops, I contacted Vitalicious about hosting a giveaway of my own! 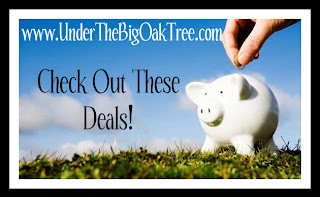 I am so happy to announce that one lucky Under the Big Oak Tree reader (US only) will receive a FREE Super Sampler Pack of Vitalicious Vitatops ($35.99 value)! Visit Vitalicious.com and check out all of their great products. Come back here to this post and leave a comment telling me what product/s that interest you or tell me something you learned about Vitalicious and their products. 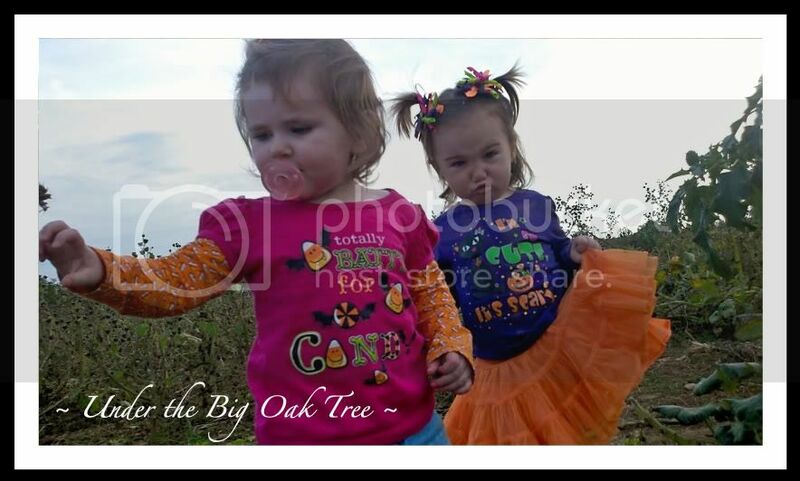 "Like" Vitalicious on Facebook and leave a comment on their page telling them that Under the Big Oak Tree sent you. Come back here to this post and leave a comment letting me know that you have done so. Follow this blog publicly using Google Friend Connect (see sidebar to the right). Be sure to leave a comment here on this post letting me know you are a follower. Subscribe to my feed via email. (See buttons on the top right of sidebar...thanks, Lisa!) Leave a comment here, letting me know you've subscribed. 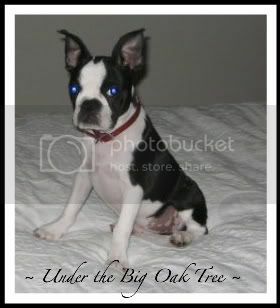 "Like" Under the Big Oak Tree on Facebook. (See buttons on the top right of sidebar) Come back here to this post and leave a comment letting me know that you've done so. Follow Under the Big Oak Tree on Twitter (again, use the buttons at the top right of sidebar). Come back here to this post and leave a comment letting me know you have done so. Also, provide your Twitter name, so I can follow you back. Tweet this giveaway and come back here to this post and leave the link in a comment. Blog about this giveaway and come back here to this post and leave the link in a comment. This giveaway is the first part of my 40th Birthday Bash Giveaway! Other giveaways will be announced in the next couple of days. 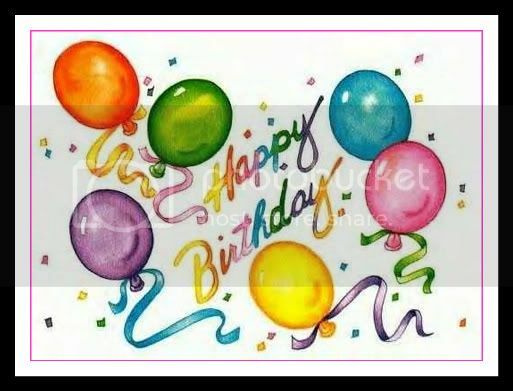 If you enter any of my other Birthday Bash Giveaways, you can earn an additional entry for each one. Just come back here after entering the other giveaway/s and let me know which ones you've entered. Leave a seperate comment for each one. I won a free Sampler Pack of Vitalicious Vitatops that I decided to review in this post. I was not compensated in any way for this review. All opinions and ideas are honest and my own. Vitalicious has generously offered to give a free Sampler Pack to one lucky reader of Under the Big Oak Tree. 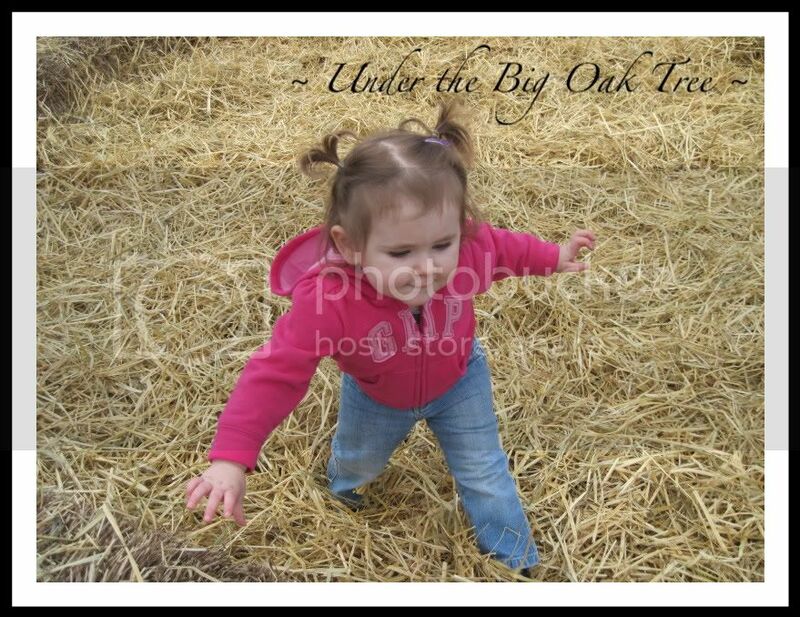 Since she had so much fun the first time, we decided to take Grace to the pumpkin patch again on Sunday. 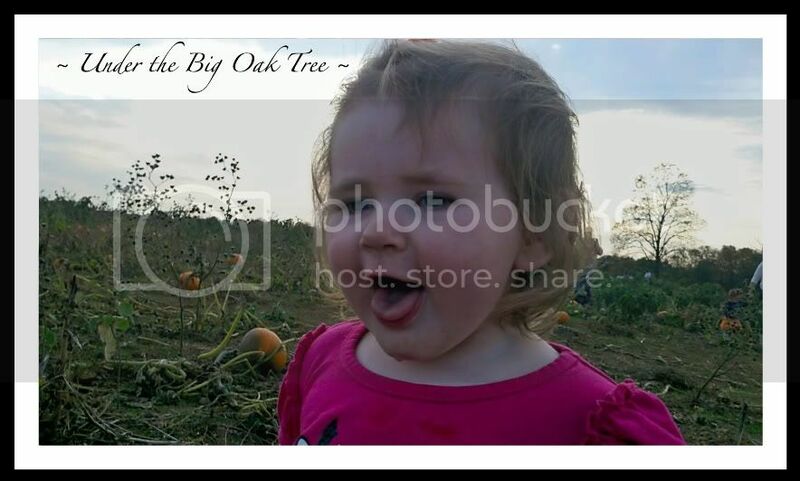 This time, we got together with our family for a great day of pumpkin picking! Say Cheese! at It's a Blog Party! Buy two 8"x10" prints and get 100 4"x6" prints FREE! 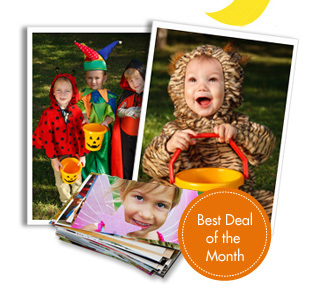 This deal is perfect for printing photos of your kiddies in their Halloween costumes! 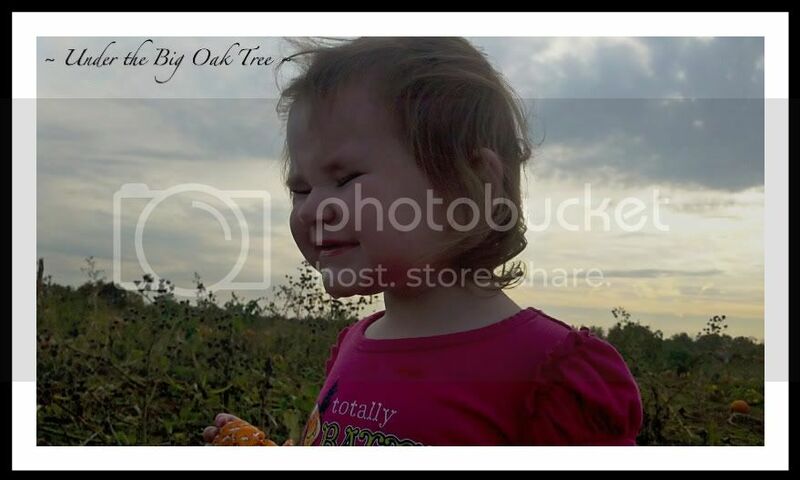 Or if you still need to get prints of those first day of school photos! Use coupon code SCARYPRINTS at checkout. I can't believe that in less than 2 weeks, I'll be celebrating my 40th birthday! (Shhh, don't tell anyone!) I'm not sure what we'll plan for my actual birthday. We usually just order take out to celebrate our birthdays, nothing fancy. Just some nice, quiet family time. That's a perfect day to me. But here, Under the Big Oak Tree, I want to celebrate with a big birthday bash and I want all of you to join the celebration! Heck, bring a friend! I've lined up several giveaways that I will be announcing this week (and possibly into next week). Each giveaway will be announced in a separate blog post with it's own set of rules. To enter, just follow the entry rules for each prize. Each giveaway will have several ways to enter. The giveaways will run until November 15th at 10:00 pm, EST. The winners will be chosen by random.org and will be announced on November 16th. I will also contact the winners by email, at which point, they will have 48 hours to contact me to claim their prizes. Be sure to check back here for giveaway updates as well as normally scheduled blog posts (recipes, tips, deals, etc.)! Most days, Joe works outside, which means he suffers through the heat in the summer or is chilled to the bone in the winter. Because of this, I try to make meals that will be a comfort to him when he gets home. I don't concern myself too much about our summer meals. I worry more about keeping the house cool and comfortable for when he gets home. The air conditioner is on most days, so eating soup or stew in the summer is okay. 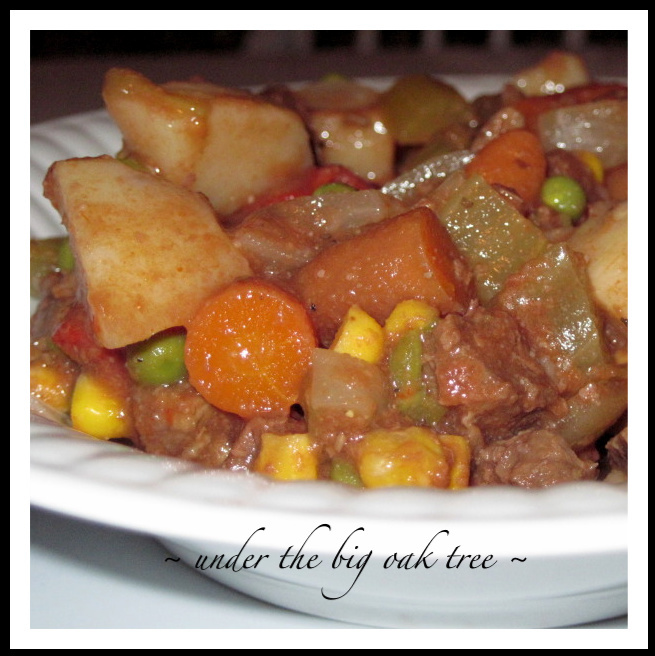 But there's nothing like a nice, warm bowl of beef stew after a really chilly day at work. Add all ingredients to crock pot and cook on low for 6-8 hours. I've also made this in the oven. Still, it's super-easy! Add all ingredients to a large baking dish or foil pan. Cover with either a lid or two layers of foil and cook in a 250 degree oven for 5 hours. I usually use London Broil when I make this recipe. I buy it when it's on a BOGO sale. I like my stew meat diced much smaller than the pre-diced meat from the store, so I skip it and go for the London Broil and dice it myself. I really don't measure anything when I make this stew. I just add whatever I'm in the mood for at the time. The tomato soup does all the work and when it combines with the juices from the beef and vegetables, it really doesn't NEED anything other than salt and pepper if you're really in a hurry. I never use the same amount of vegetables. It varies each time I make it, according to what I have in my veggie bin. If I'm running low on potatoes, I add more carrots. If I'm out of celery, I skip it. It's really a fool-proof recipe. Sometimes I add frozen vegetables. Either whole corn or frozen mixed veggies. Whatever is handy at the time. Also, the only other liquid I add to the stew, is just a bit that I add to the can to get as much of the soup out of the can as possible. I use one or two cans of soup depending on how many veggies I add. I originally heard about this recipe from a co-worker (back when I was still working). She found this recipe in her grandmother's recipe box and told me how easy it was to prepare. Her grandmother's recipe only called for the meat, vegetables and tomato soup. Wow! I felt like last week was such a busy week, although, at the same time, I feel like I didn't get much accomplished. I worked on Grace's schedule a bit last week, and feel as if we're on the right track. Months ago, I was able to get Grace to sleep in her pack and play just outside of our room. Just recently, she's been refusing to sleep in the pack and play and has been wanting to sleep with me. It's been rough. Thursday night, I tried her in her crib. It took several times of me laying her back down but she eventually fell asleep. She woke up screaming and wanting out at 3:00 am. But I just put her back down until she gave up. Friday night, same deal. Many tries, but she got the point. She also woke in the night wanting out, but I didn't give in. Saturday was much easier. She fussed initially, but after laying her back down, she snuggled up and fell asleep. She woke up, whined, found her binky and fell back to sleep on her own! Last night, she DID NOT fuss at all when I put her down and she DID NOT wake up wanting out in the middle of the night! (Yay!) 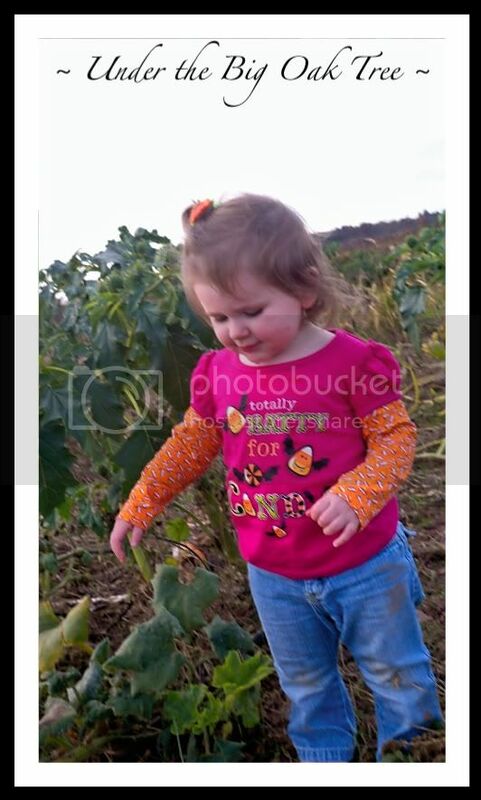 The busy day at the pumpkin patch may have had something to do with that! I managed to clean up a bit this week. I tidied the main points of the house: kitchen, living room and bathroom. The basement and bedrooms are still a wreck. The entire house still needs a good cleaning, but I'm satistifed that I accomplished just that much last week! Also, I tried 2 new recipes last week. 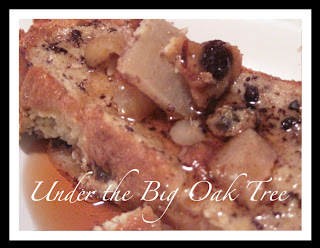 First, I made French Toast Casserole using this recipe that I found on Allrecipes.com. I switched some of the measurements around a bit, but not enough to repost the recipe. Mainly, I just halved the recipe since it was just the two of us eating it. I couldn't find my vanilla extract so I left it out. I added some slivered almonds and a bit of maple syrup to the apple/raisin mixture. I really like that about this recipe. It's so easy to switch a few ingredients here and there to adapt to your tastes or what's in your pantry! For the second recipe, I strayed from my menu plan. I just had to! 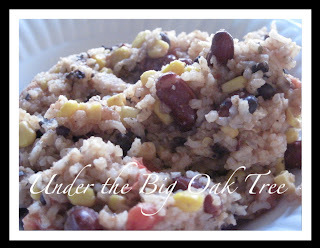 I've been wanting to make rice and beans for a couple of weeks and just never get around to it. After seeing Lisa's post for her Santa-fe Style Rice and Beans, I just had to make it! I stuck to the recipe as much as I could, only making a few small changes. I used frozen black beans that I had prepared from dry beans a few weeks ago instead of the canned black beans. I added 1/2 a can of fire roasted diced tomatoes with some liquid, mainly because they sounded really tasty as I was checking the pantry for the rest of the ingredients I needed for this recipe. I left out the cheese and sour cream. I didn't do a very good job of reading the recipe and assumed that they were toppings and not mix-ins. I topped mine with a bit of taco cheese, Joe topped his with the cheese and sour cream. I really loved this recipe and I'm very pleased that we have leftovers to include in this week's menu plan. I also made a chicken dish last week(I'll share it later this week). It was not on the menu plan either. Joe bought some split chicken breast on sale for 10 lbs. for $10. I didn't have any room in the freezer, so I cooked it all to use in recipes this week. With Halloween being this weekend, I'm not sure what we'll be doing. I don't want to plan too much. But I'm sure we'll have plenty of leftovers to choose from if we're home! As always, I'm linking my menu plan over at Menu Plan Monday! To start of this week's Blog Love post, I thought I would share a couple of pictures of Grace from last Halloween. 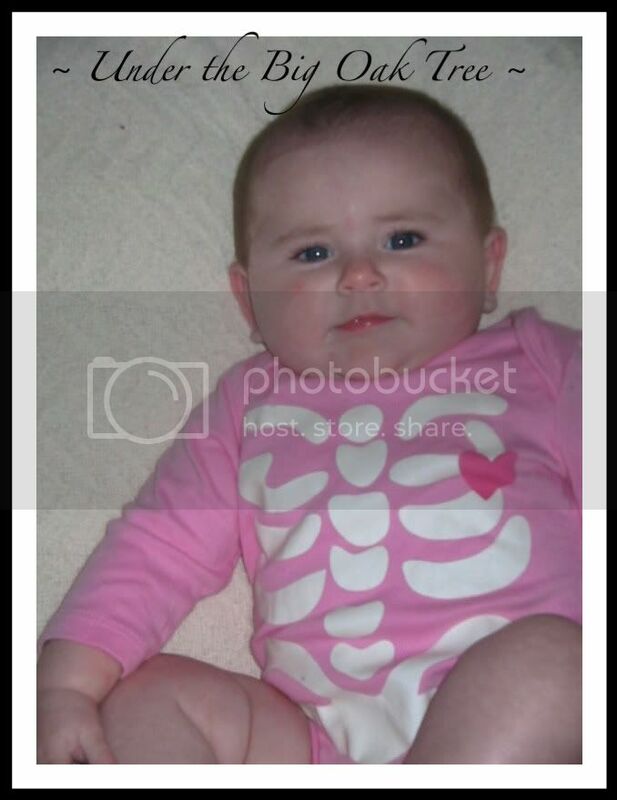 I can't believe how big she has gotten since then. Or how quickly the time has passed! 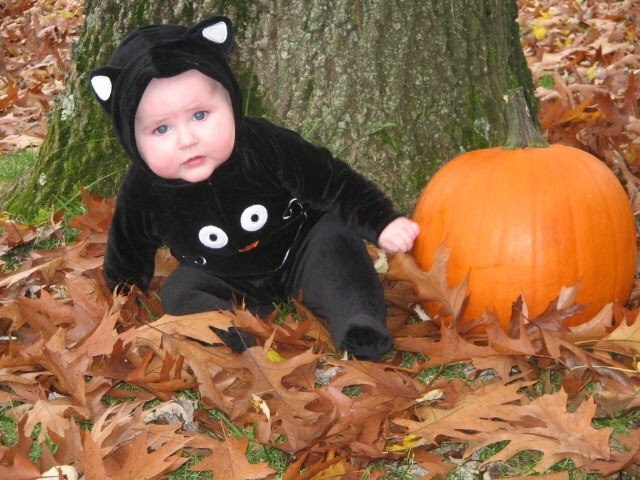 Soon, I'll be posting photos of Grace in this year's Halloween costume. Mum in Bloom shares a slow cooker recipe for Turkey Chili. I know chili isn't just a fall meal, but I'm thinking how wonderful this would be perfect after a chilly day at the pumpkin patch! And how about a cookie topped with candy corn, m&m's and chocolate for dessert? Iced Tea in the Afternoon posted her recipe for Candy Corn Cookie Bark. Festive and delicious! Mmmm! Tania from what'chu talkin' 'bout willis? 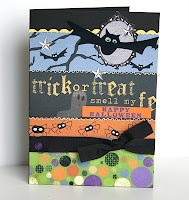 shows off her fabulous handmade Halloween greeting cards on her blog, what'chu talkin' 'bout willis? You can also find them in her Etsy Shop. I was the lucky winner of some of her beautiful, fabric flower embellishments a few months back. I haven't gotten a chance to use them for anything yet, but I do have a few ideas. The ladies over at Homemade Mamas show us how to make Recycled Favor Boxes perfect for Halloween treats! That's all for this week! Isn't the Tupperware/Rubbermaid cabinet every kids' favorite place in the house? Grace could keep herself busy for hours pulling everything out of this cabinet. She examines every lid and every bowl. She takes things out. 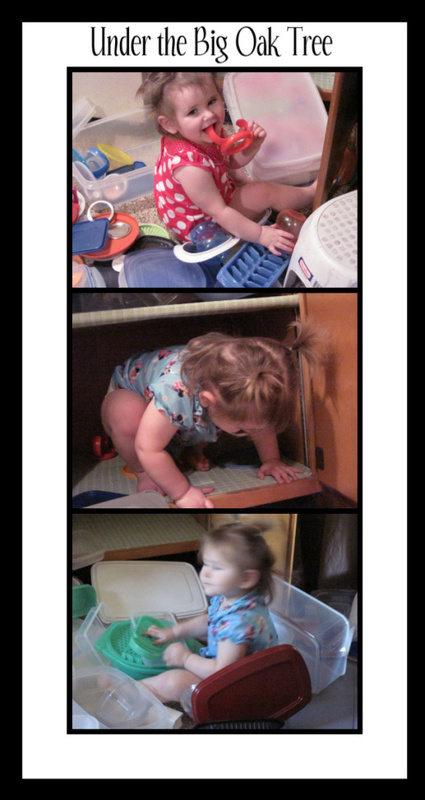 She puts things away. She climbs in. She pulls stuff in with her. I sent Joe a text message at work one day, telling him it was time to put the safety latches on the kitchen cabinets. 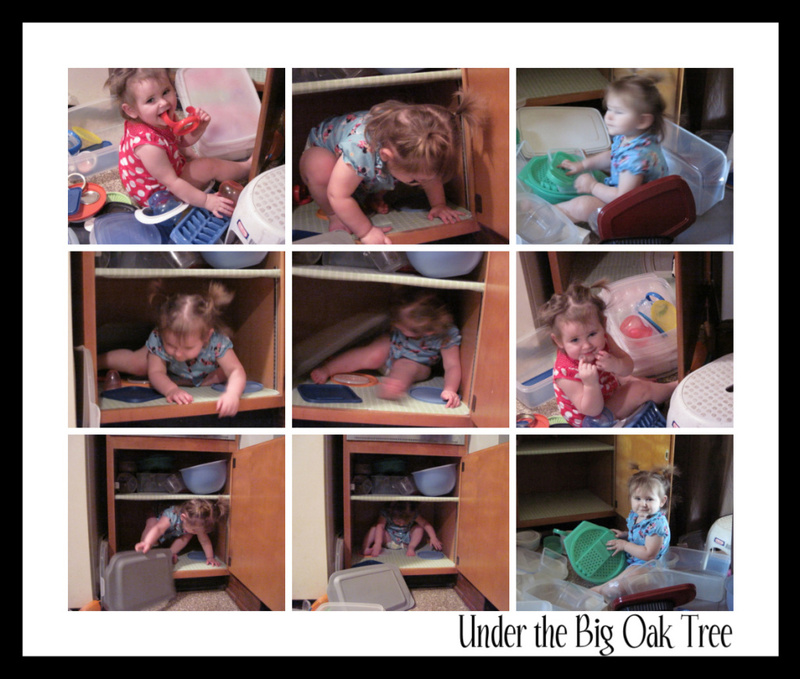 Meaning all of the other cabinets in the kitchen: the pots and pans cabinet, the glassware cabinet, the cabinet under the sink with all the dangerous stuff. 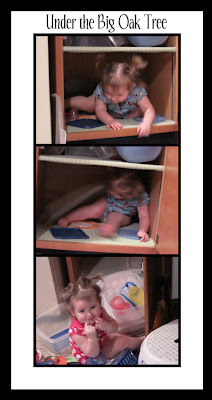 I really didn't care if she got into the plasticware cabinet, it keeps her busy when I am cooking or cleaning up (the rest of) the kitchen. Sure, I have to re-wash the bowls before I store anything in them to get the baby drool and any stray dog hair cleaned off of them. The fact that she's not begging me to pick her up while I'm stirring something from the stove, makes the extra work or rewashing the bowls worth it. I wasn't paying attention when Joe was adding the safety latches and he put one on this cabinet. The next day, Grace walked over to her favorite cabinet and tried to open it. She pulled and pulled and screamed and cried. Her heart was broken. 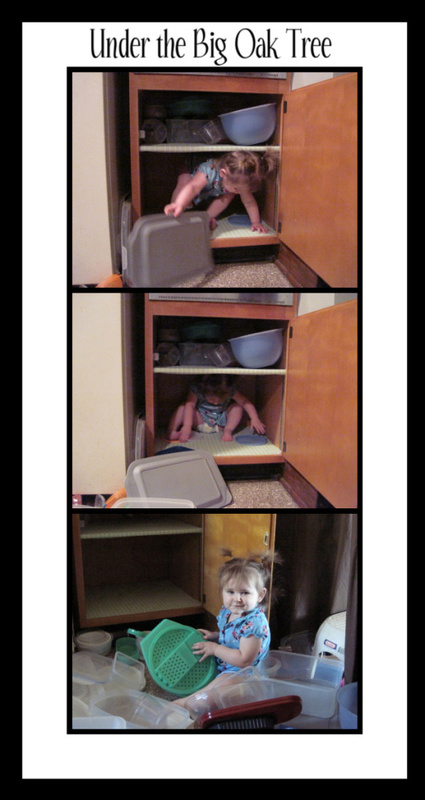 She forgot about it for a couple of weeks, until she saw me putting away some stuff from the dishwasher while she was sitting in her high chair. 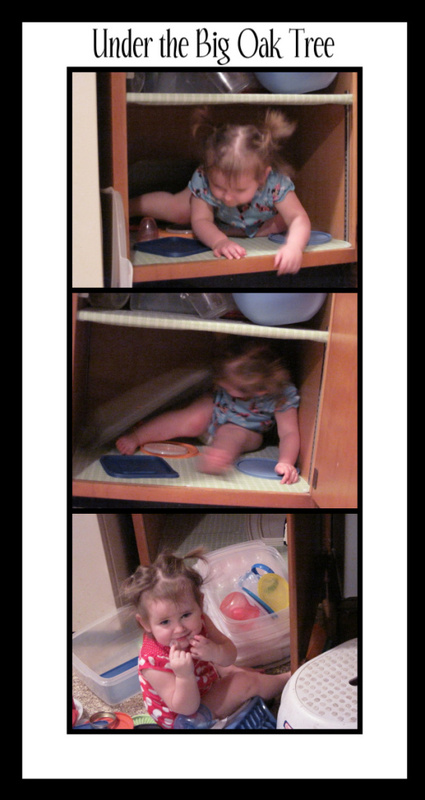 As soon as I took her out of her chair, she ran to the cabinet. Again, she was heartbroken. I think I'll get the screwdriver and take the latch off of that cabinet. One of our favorite comfort foods is Hamburger Macaroni. It was one of my favorite meals when I was growing up. Mom made it pretty often. I always thought she made it because we all loved it so much. Now, I suspect it was because it could be a cheap and filling meal if there was a sale on ground beef. When I made Hamburger Macaroni a couple of months ago, I decided to load it with veggies. 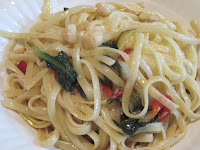 Not only did it ensure that we ate our vegetables, it also really helped in stretching this recipe. Joe and I ate it for 2 dinners and I served it to my three nieces for lunch when they came for a visit. My picky niece (hates vegetables) ate 3 servings and was trying to scrape the serving bowl clean! Do you think that she liked it? Maybe just a little! I haven't made it since then, but now that I am typing this, I am thinking about adding it to next week's menu plan! I hope someone is having a sale on ground beef since we don't have any left in the freezer. Now, I used McCormick's Brown Gravy Mix. for the gravy in this recipe. Mom always used powder gravy for this recipe and that's how we like it! But if powder gravy isn't for you, then just switch it for your favorite homemade beef/brown gravy. Cook macaroni as directed on the package. 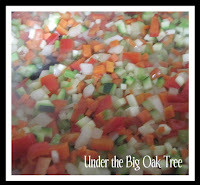 Add ground beef when the veggies are just starting to become tender. Add the gravy and allow to cook for a minute or two. Add the diced tomatoes, frozen peas and corn, along with the worcestershire sauce, salt and pepper and any other seasonings you may like. Bring to a boil, then cover and reduce heat. Allow to simmer for a bit, to allow all the flavors to blend together. Add cooked and drained macaroni and mix well. Like I mentioned above, you could easily substitute your favorite homemade gravy for the powdered mix. 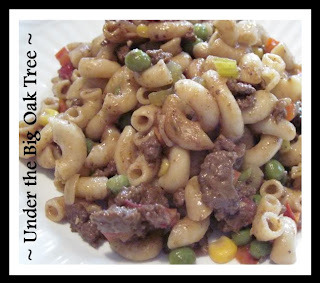 I usually add crushed red pepper flakes to my Hamburger Macaroni to add a little bit of a kick, but since Grace has started eating table food, I've had to cut back on the "heat" that I add to our recipes. Instead, I keep the crushed red pepper flakes on the table with the salt and pepper and add to my own individual serving. I'm sure that this would be great with great made with ground turkey or chicken to make it a bit healthier. Although, for this recipe we do prefer the beef. 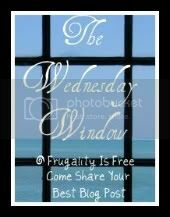 Being Frugal and Making It Work has joined Frugality is Free in hosting Follow Us Monday Morning. There's a new topic of discussion this week, too! If you want to join in on the fun, click the Follow Us Monday Morning button at the start of this post. When was the last time you went camping and what's your favorite camping destination? It's been a few years since we've gone camping. While it's something we love to do, Joe's crazy work schedule doesn't really allow for too many quiet weekends in the woods. During the summers of my high school years, my parents rented a campsite at a family-run campground in Bucks County. We had a trailer for several years before then. We spent every weekend of those summers there and I met a lot of great friends there. I haven't seen them in many years, but thanks to Classmates.com and Facebook, I've been able to find most of them again and keep in touch. Out of all of the many places we've camped in almost 40 years, Bass River State Forest and Beaver Valley Campground would have to be my favorites. Sorry, no way I could possibly narrow it down to one favorite! Too many great memories of both places! Oh, speaking of almost 40 years....next month I am celebrating my 40th birthday. Starting this week and running until next month, I'll be announcing a few giveaways to honor the occasion! So, be sure to keep checking back to find out the details! This week I am determined to get my house under control. I've fallen behind on all of my daily tasks due to lack of sleep. Grace's schedule is at it's worst point right now. After a month or two of sleeping on her own, she's back to wanting to sleep with me and has been super-clingy. I'm guessing the change is a result of some new teeth coming in, but whatever it is, it's really taking it's toll. Laundry is piling up, dust bunnies are taking over the house and the bathroom is filthy. I'm hoping that will all change this week. My first step in getting back on track is to menu plan! I'm not going to prepare anything fancy for this week since I have a lot of catching up to do in other areas of the house as well. This week is going to be all about convenience and using as much of what's already in our pantry or freezer as possible. I'm just planning the five meals, since I have a feeling that the weekend is going to be another busy one. If we end up home at mealtime this weekend, we'll either order a pizza or open a can of soup. I still haven't gotten a new crock pot, otherwise I would have a crock pot of soup cooking and waiting for us when we get home. I've been in the mood for some Beef Barley Soup, so if I find the time, I'll squeeze it in. I have all the ingredients, but I want to focus as much time as I can on getting the rest of the house back in order! 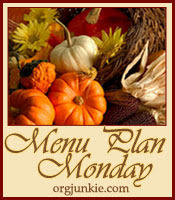 Don't forget to check out Menu Plan Monday hosted by I'm an Organizing Junkie for more menu plannning inspiration. Katie from The Cutting Back Kitchen made this Topsy Turvy Apple Pie to celebrate her parent's 30th wedding anniversary. How yummy does this look? And in case you can't tell by the photo, this is not your traditional apple pie! It's served upside down! Yvonne spent 4 days trying to find the perfect caramel for her Stone Gable No Fail Caramel Apples. These caramel apples are almost too pretty to eat! I love the twig stems in place of the usual popsicle stick! And the sweet, little ribbons on the end are just the perfect finishing touch! I love Oreos! So much so, that we can't have them in the house. I can inhale an entire package of them by myself in two days! I have no will power...especially if Double Stuffs are involved! 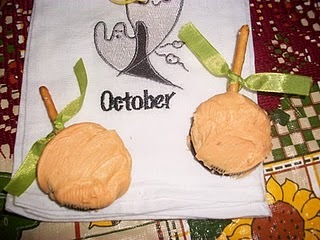 I might have to pick up a single serve package so I can make some of these great Chocolate Pumpkin Oreos that I found over at La-DEE Da Creations. 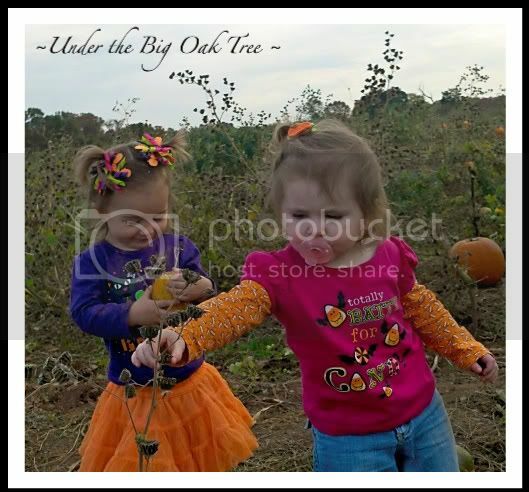 Christy's posts are becoming a regular thing here on Blog Love! Can you tell that I really love her blog? Last week was Ghost Week over at From Glitter to Gumdrops. 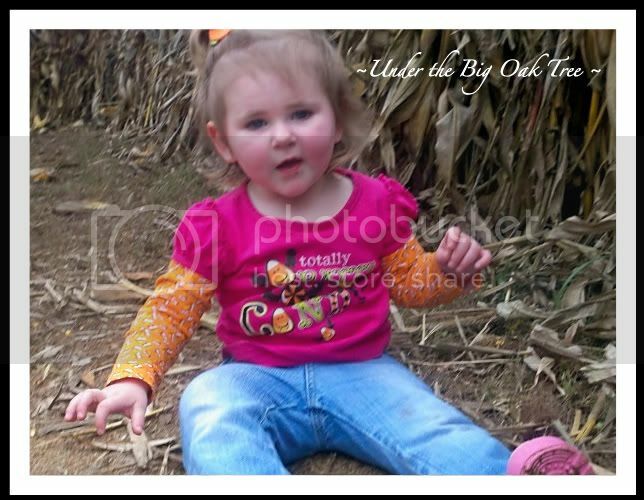 This week, she is all about the Candy Corn! This idea is so crafty and a more "Martha-ish" spin on just tossing some candy corn onto some cupcakes or other baked goods. I already devoured finished my bag of candy corn this year, I'll have to grab another bag this weekend so I can attempt to make some Candy Corn Fondant. As a final Blog Love for this week, I wanted to tell you all about a giveaway that's going on over at Extraordinary Life. 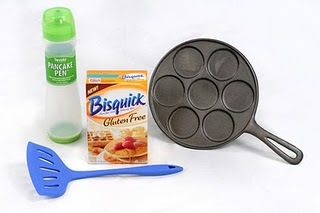 Lisa is giving away this great Pancake Prize Package and offers 5 ways to enter! Check it out...giveaway ends on Monday, October 25th. 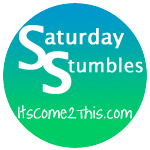 Saturday Stumbles hosted by It's Come 2 This. Wordless Wednesday ~ So serious. The new laptop is here!!! !